Ever wanted to be able to yell out “aaannnnd ACTION!! !” and here that tiny clap for your cell phone movie shenanigans? 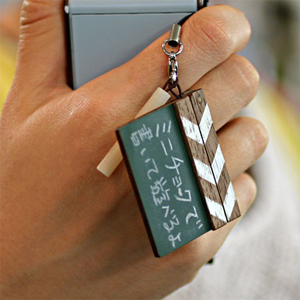 Well the fine people over at Strapya have come up with another new netsuke, the Soranuma Koubou Woodcraft Clapper Board Cell Phone Strap. Even coming with its own chalk, you can now mark all those moments with a tiny clapper board when you take pictures or videos with your cell phone. Or you can just run around clapping it in people’s faces yelling at them that they just “Got the Clap”. Be your own mini director. This entry was posted on April 26, 2007 at 8:59 am and is filed under Japan, Online, Shopping. You can subscribe via RSS 2.0 feed to this post's comments. You can comment below, or link to this permanent URL from your own site.